Wow, we haven't done a Thursday Thoughts post in a long time. There's something I've been thinking about for a while and of course it has to do with running. 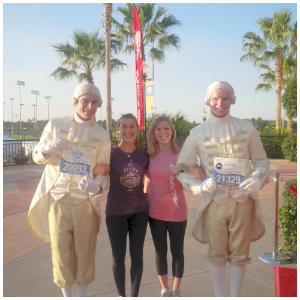 Before I started running long distances, I was a spectator of long distance running. 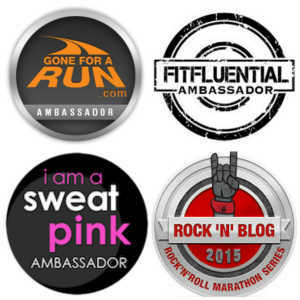 I watched my sister run half marathons and marathons before I even considered running one (or two) myself. As a spectator waiting at the finish line at these races, I saw runners come through who could barely make it across the finish line on their own. I've seen people collapse at the finish line and of course heard of people seeking medical attention and even dying along the course. Wow, these races must be serious (even the half marathons). Of course I never thought I would get to that level of running. And with so many things that could go wrong, who would want to, right? But then I did it. I ran a half marathon and guess what, I crossed the finish line up right. I even went on to run a full marathon and finished up right then too. In spite of everything that can go wrong, I finished. Watching the elites run the Olympic Trials on Saturday and seeing Shalane struggle really hit this point home. These races are not easy. Even the elites struggle. As I was watching them cross the finish line I thought "Wow, I can do that too" I can certainly not run it at the same pace as them, but I am covering the same distance. That's kind of a big deal, don't ya think? We all live in a social media driven world where we can see every race that every one runs. It seems like people run half marathon like it's their job, ticking off one after another, state after state. We've come to assume this is "normal" and that everyone does it. You might think its normal only because you have surrounded yourself with people and social media networks where they are always talking about it. But really there is such a small population that has ever run a marathon, a half marathon, or even a 10K. Heck, even running a 5K is a huge accomplishment. So my point is, it doesn't matter if you an elite runner, a fast runner, or have just completed your first long distance race, You are accomplishing something that not every gets to experience. For that reason, YOU are a big deal! Yes I totally agree! We exercise enthusiasts tend to surround ourselves with other like minded people and all the achievements can seem routine but they are a big deal! I agree!!!! I hope all runners know they are a big deal for finishing something they started, no matter how fast or how long! Just thought of doing something the elites can do I think is a big deal! Yes it does seem like everyone is doing them but them when I remove myself from social media and take a look at the people I know who run in my community, the circle gets a little smaller! I so love & appreciate this because while I'm working to train for a half marathon, I feel like there's so many people out there humph'ing the idea like, "A piddly little half marathon" while they're training for 26.2 & ultras & Ironman's ... I try to think about the people who I know that won't even walk around the block much less do 1 mile - much less 13.1 ... I try to not let the comparison thing hit in. Oh man. Shalene at the finish line. All the feels! 13.1 is a SUPER big deal! I can remember when I thought that distance was so beyond what I was capable of! Any distance someone attempts is important to them and should never be looked down upon. Anyone who does look down upon them, either just has poor sportsmanship and is likely cranky in everything in life. Or they are just jealous and wish they could be doing it too. I absolutely agree! I often tell people running is hard. Even though some folks make it look easy it's difficult so anyone that runs any distance at all is a hero. I think watching even some of the elites struggle proves just how hard it can be! 100% agree. Running my first half was life changing, and then finally doing a full marathon even more so!!! LOVE this ! I fully agree, it is a big deal. And sometimes we do forget. Yeah, I am going to be pretty damn proud of myself when I finish my first marathon April 3rd ! I definitely agree! I never thought I would be a long distance runner either, but any distance running is amazing and an accomplishment. Especially if its something that pushes you out of your comfort zone! Yes, yes yes! Just crossing that finish line is a win. YES! You're so right that when we surround ourselves with runners, running an endurance race seems like no big deal. But then I go to a party with non-runners and start talking about running, and it really hits home that we're in the majority. 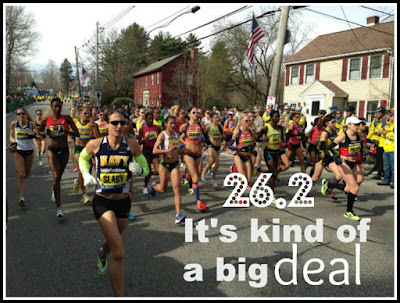 Running any race IS a big deal, and something we should all be proud of! This is beautiful :) Yes, it is a big deal! I thought that this weekend, I was driving a stretch of road that is 9 miles, it is on my way to the park. I thought how desensitized as runners we are to how far that really is!